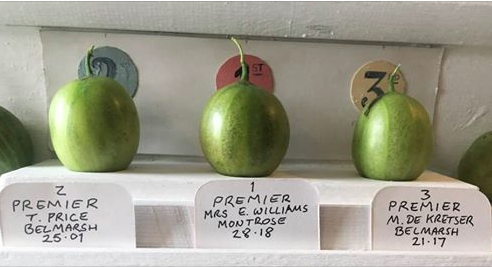 Emma Williams has won the 2018 trophy for the heaviest premier goosegog at today’s 121st Goostrey Gooseberry Show, held at The Crown. Her Montrose berry weighed 28 pennyweights 18 grains. Terry Price’s Bellmarsh berry was 2nd at 25 pw 1 grn and last year’s winner, Martin de Kretser, came third with a Bellmarsh at 21 pw 17 grns. Well done all! This entry was posted in Gooseberries. Bookmark the permalink.